I have always had an interest in astrology; not in reading generic horoscopes in papers or magazines, but in the scientific aspect of mapping the planets and stars in the sky at the exact time we are born into this life. I love the idea that the position of the planets might have an influence on shaping our personality and our life path – our personal star map to help guide us through our life journey, while allowing our own free will and self-awareness to help us make choices along the way. A couple of years ago, I saw that one of my favourite mixed-media artists, Suzi Blu, and her friend Courtney were offering astrological birth chart readings. I had always been aware that my personality was vastly different to that typical of my star sign and, curious to learn more about it, I signed up for a reading. I provided my exact time, date, and place of birth, and a couple of weeks later I received a PDF chart and a recorded in-depth explanation of the signs and personal interpretation of how it all related to my life. So much of it made perfect sense. Without knowing me, they were able to pinpoint my personality exactly and I was able to make sense of that which had always puzzled me. They also validated that I was on the right path with what I had chosen to do with my life, but suggested that my soul’s purpose was to delve deeper into my emotions, talk about uncomfortable things, and to write deeply things that are meaningful to me. I am very fortunate to have had a good life with wonderful family and friends, a happy upbringing, and a happy marriage. The one thing I have struggled with over the years is social anxiety, which at times has led to crippling panic attacks, and in the past made school and work situations unhappy places to be. After the reading I thought about what Suzi and Courtney had said and, soon after, I began writing ‘The Air that I Breathe.’ Although written as a fictional novel, this was a story with which I had a deep personal connection and could write from a heartfelt place of experience and emotion, a story that touched on my own personal experiences with social anxiety and panic attacks. 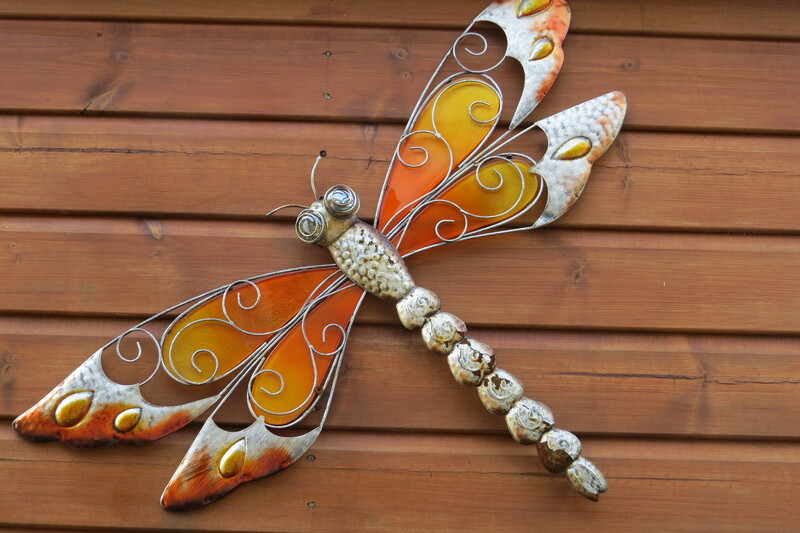 But rather than dwell on the negative aspects, I wanted it to be a story of how we can create our own life path by choosing to live an authentic life and build a life around the things that allow us to feel happy and fulfilled. We shouldn’t be defined by our fears, our weaknesses and imperfections, but rather we should choose to shine a light on all that is good in our lives, on our strengths, our talents and capabilities, and on all that we have to offer others. Social anxiety is only a small part of my life now. I have created a life around the things and the people who make me happy, a life that is full and rewarding. I haven’t had a panic attack in a long time. I know the triggers, I do my best to avoid those situations, and knowing I can choose to avoid them makes all the difference in the world to my personal wellbeing. 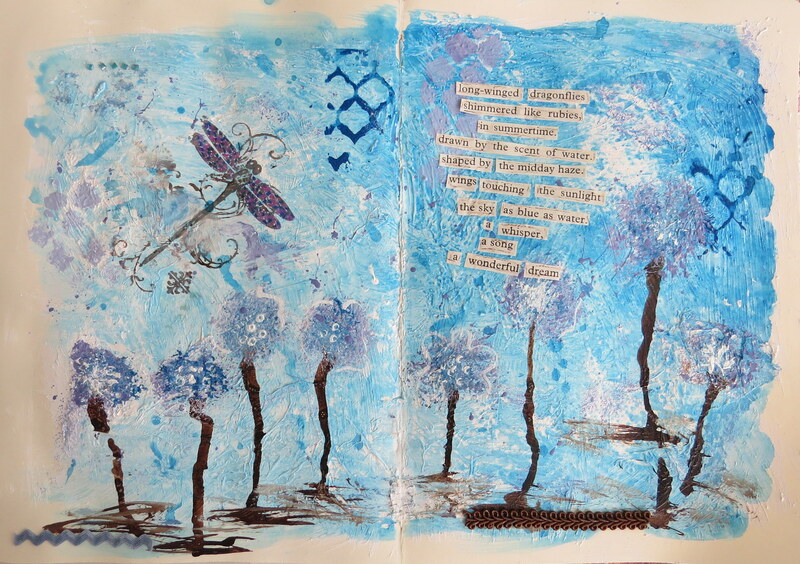 This art journal page depicts my star sign, Aries. I had a lot of fun painting it, with bursts of colour denoting moments of creation in the universe. Actually, they were blobs of paint that I peeled from my pallete paper the next day and stuck to the page. I thought they added a unique element to the painting. I love looking through magazines for inspiration. 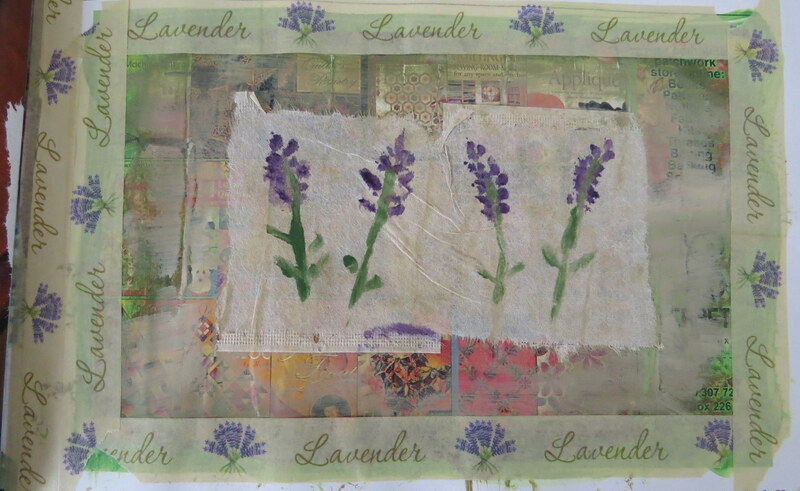 Some of my favourites are Somerset Studio, Somerset Art Journaling, Sew Somerset, and Daphne’s Diary. I also love reading gardening magazines and the Australian Country Craft magazines. I am very lucky to have a wonderful mum who also loves to read magazines and passes them on to me after she has finished with them. Once I have read the magazines (often several times), I pull out pages with crafts or recipes that I would like to try, home decor, botanical art, poems, or pictures that make me feel happy. 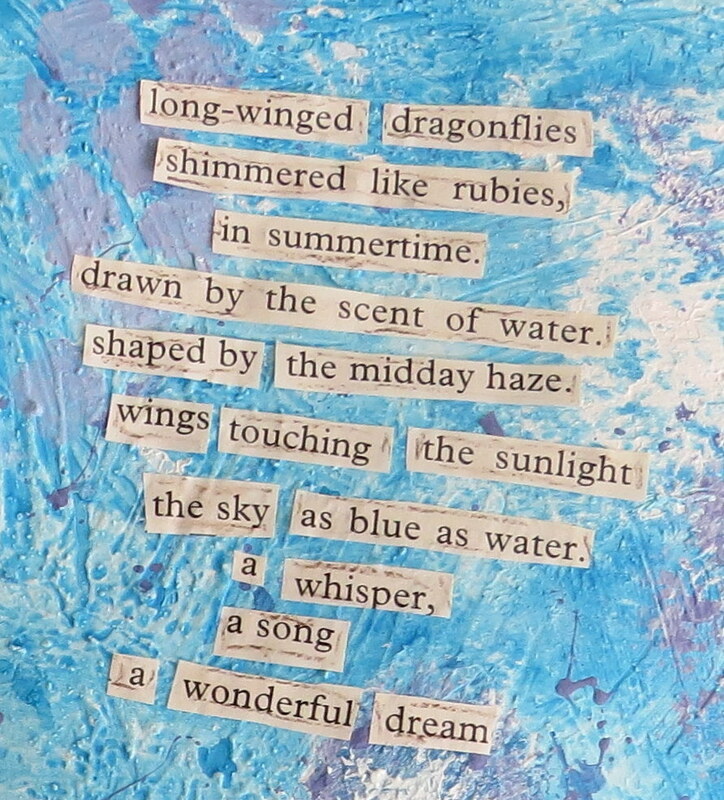 I also take out pages and cut out words that I can use in my collage. After that, what is left goes in the recycling. 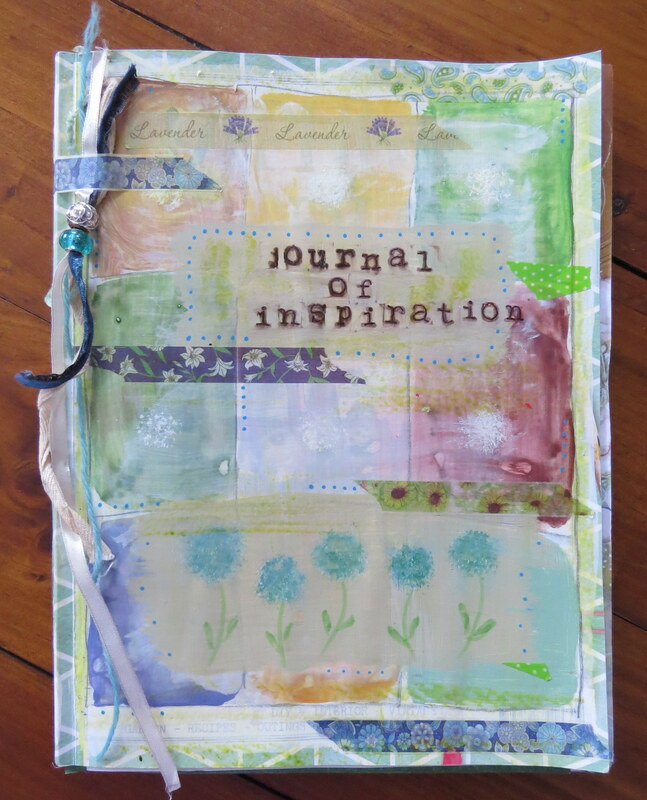 Recently I decided to take the folder of inspirational pages I had pulled from the magazines and make them into a big journal of things that I love. To make the journal I took one of my magazines and removed all the pages from it that I didn’t want to keep, leaving a half inch border along the spine of each page. Then I took my stash of inspirational pages and glued them onto the half-inch tabs, while others I attached with my favourite washi tapes. Some pages I glued back to back, covering up the sides I didn’t want to keep. On other pages I made mini collages, or used paint and washi tape to cover up parts I didn’t want. 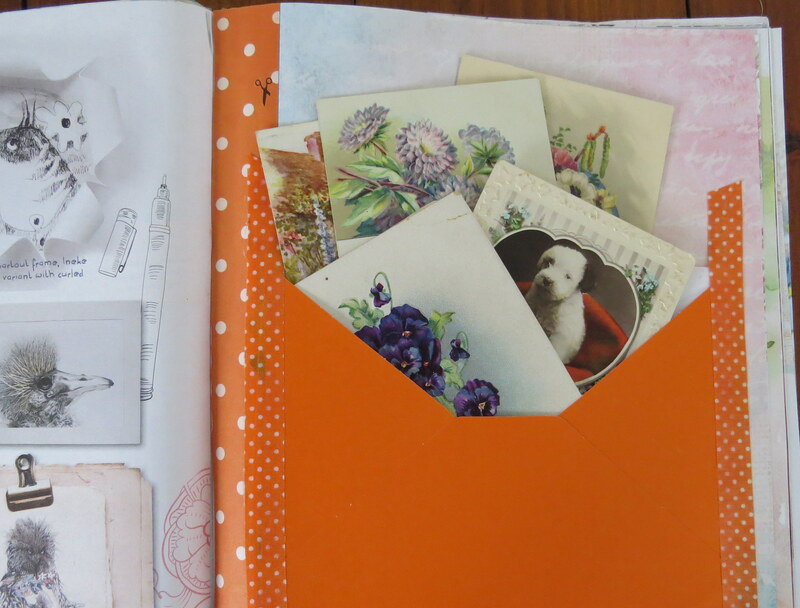 I made a pocket on one of the pages to hold some of my vintage greeting cards. I decorated the cover using gesso, acrylic paints, inks, paint pens, and washi tapes, and I added some fibers and beads down the side. 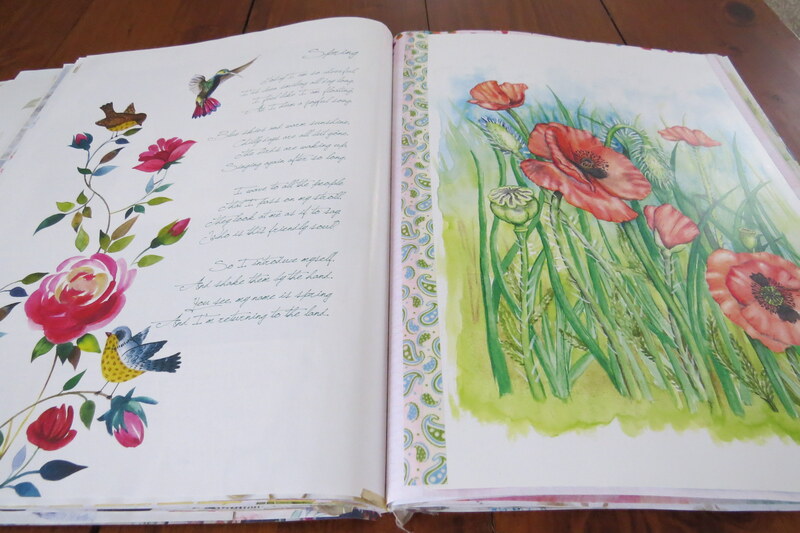 My journal is a big book of inspiration that I can take out and look through when I want to relax. 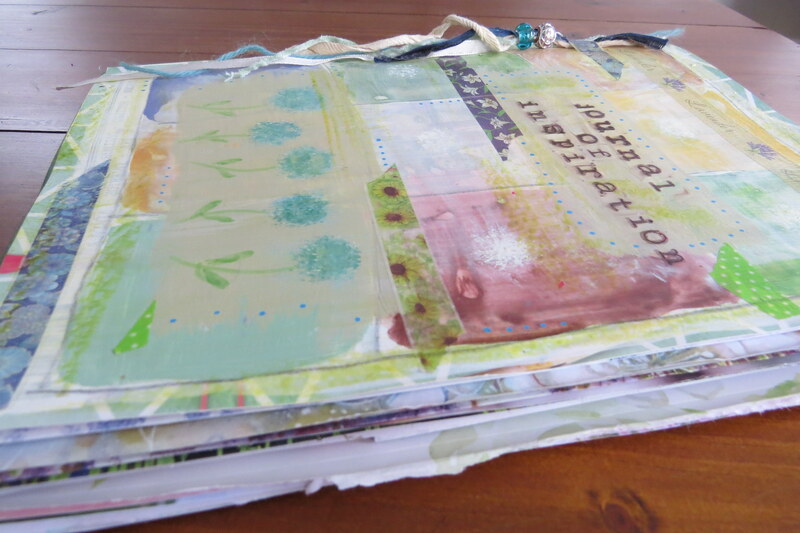 And the good thing is I can keep adding pages to the journal – the bulkier the better!